Most of the information on musicians, recording dates, location, etc. 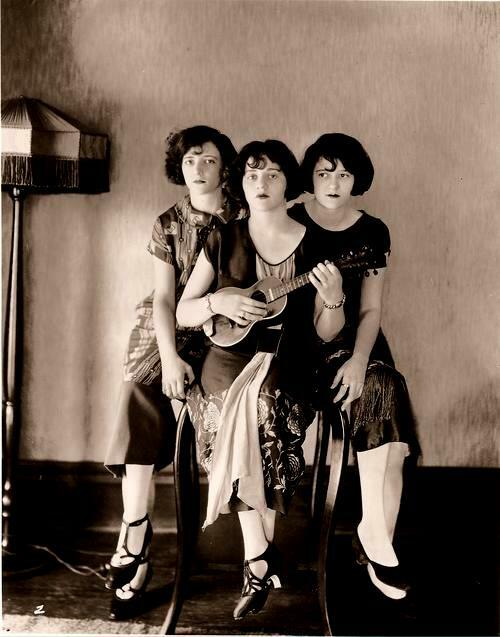 is from the Boswell Sisters Discography at guymcafee.com. I’ve retained the order of dates used at that site when the info is used here, month/day/year, while continuing to use the order day/month/year elsewhere on the site. In numerous instances I have changed the order of songwriting credits to my customary composer(s) first, lyricist(s) second. I aim to do this uniformly throughout, eventually. Of the six recordings made in 1925 three were rejected. The remaining three recordings were of two songs written by Martha Boswell, I’m Gonna Cry (Crying Blues) and Nights When I Am Lonely. I haven’t found the first of these, but the second is available at Youtube. In 1930 they moved to New York and began to record popular songs, quickly drawing many top jazz musicians to support their unusual and imaginative vocal arrangements. According to McAfee, the recording of I’m in Training for You, for which I’ve transcribed the lyrics, is one of a group of four songs in the first issued set of broadcast transcription recordings of the Boswell Sisters (on 16 inch disc). One previous set of 1930 broadcast transcriptions was not issued. 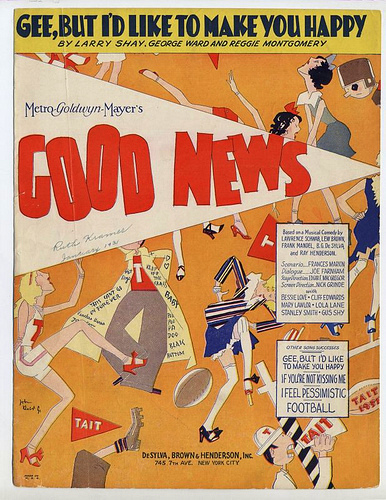 Good News (1930) was the first of two MGM musical films based on the 1927 Broadway musical of the same name. In the film the song was sung and danced by Gus Shy and Bessie Love, twice, according to IMDb. Does My Baby Love? (m. Milton Ager, w. Jack Yellen) — Previously recorded on 5 November 1929 by Van and Schenck; issued on Victor 22352, c/w “Dougherty is the Name.” Performed by Gus Van and Joe Schenck (Van and Schenck) in the 1930 “sports drama” musical film They Learned About Women. Say, does my baby love? And does my baby kiss? Boy, has he got It! And does my baby pet? According to Boswell Sisters discographer Guy McAfee, this is one of a group of four recordings in the first issued set (on a 16 inch disc) of broadcast transcription recordings of the Boswell Sisters. One previous set of 1930 broadcast transcriptions was not issued. No session date is given for most of the 1930 recordings, including this one. Most of the introduction by an announcer, credited by McAfee as Everett Barksdale, has been removed from the audio file used in the first video below. *Sources differ as to the cause of her disability. I don’t necessarily favor the view given in this profile.